The DocOptic Forms & Shapes kit consists of 90 VJ loops based on abstract forms and shapes from 3 pre-selected sets. This bundle includes 20 explosive one-shot geometric 3D shapes perfect for impactful visuals hits. 20 patterns and textures based on organic and abstract digital formations. 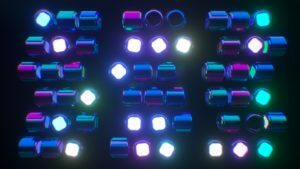 For dynamic overlays, this kit also includes 50 glowing 3D shapes perfect for layering sporadic, oscillating animations that include alpha channels. This kit is especially useful for projection mapping and surfaced-based live visuals. Instantly download this bundle in the format of your choice. View the FAQ for information regarding screen resolution and performance.